The Nalu 10’10” GTW/GS is an all-around, extra stable design for touring, carrying gear, tandem paddling and small surf. 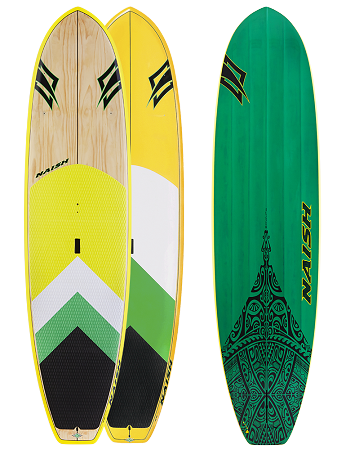 It features a radical multi-concave bottom shape that channels the water from nose to tail. 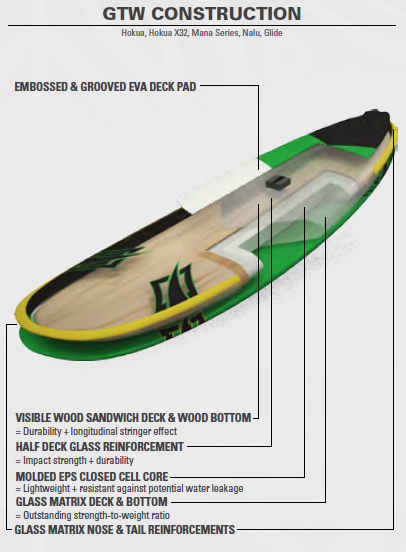 The multi-channel bottom combined with the low rocker makes it glide incredibly straight for a wide board of its length. The wide outline and slightly recessed deck in the standing area provide unmatched stability. The forward deck has eight insert holes for a bungee accessory to carry coolers and gear. One of my favorite boards. I have paddled this board in ocean, river and lake environments and it handles all of theme with grace. 80% flatwater and 20% surf. Meaning, if you want it for mainly saltwater with the occasional knee high surf, it will be perfect. I weigh around 175, but have had (2) four year olds on the board and had no trouble controlling it. The channels on the bottom of the board really help it track and the glide is excellent for it's length due to the low rocker.